The beloved patriarch of the peace-loving Smurf clan, Papa Smurf is one of the shining stars in 1980’s-era animation. From the top of his little red hat to the soles of his tiny red shoes, Papa Smurf is filled with love and affection for all of the creatures under his care. Here are ten lovely lessons that children can learn from paying attention to Papa Smurf. 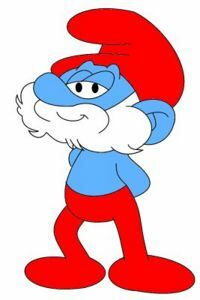 Age is Just a Number – Though most viewers would never guess how much of an age gap there is between Papa Smurf and the rest of his clan by observing his behavior, he is actually more than five hundred years old, as opposed to their mere century or so. Good Leaders Don’t Rely on Scare Tactics – Papa Smurf knows that it’s not necessary to inspire fear in order to retain respect. He relies on his love for the Smurfs and theirs for him to govern, rather than ruling with an iron fist. We Can All Get Along – Making sure that all of Smurf Village is getting along without any arguments or cross words is Papa Smurf’s number one priority; he does so with the knowledge that peace is possible, though he will resort to magic in serious situations. Everyone Needs To Learn Leadership Skills – Though he has no intention of abdicating his role, Papa Smurf understands that everyone needs a chance to acquire and foster leadership skills of their own. To help his Smurfs learn this lesson, Papa chose to give them all turns with his red hat, proving that they were all fit to lead if necessary. Even Villains Need Love – Instead of fighting back in a way that would cause the villain Gargamel damage, Papa Smurf instead chooses to treat him with as much kindness and respect as possible. Those in Authoritative Roles Must Offer Constructive Criticism – Though he would never deliberately hurt anyone in his village, Papa Smurf understands the importance of gently offering constructive criticism to help correct bad habits. We All Have Our Role Models – Though all of the Smurfs in Smurf Village look up to Papa Smurf, he has his own role model: Grandpa Smurf. Children seeing the wise Papa Smurf look to Grandpa for guidance sends a strong message that we all need help from time to time, and that no one has all of the answers. Friends Come in All Shapes and Sizes – Papa Smurf maintains good relationships with all types of nearby beings, including a group of humans. Rather than relying on prejudices and fears of those who are different, Papa embraces everyone. Retaliation Doesn’t Help Anything – Even when given just cause and ample opportunity, Papa Smurf will never strike back against Gargamel, because he knows that retaliating won’t help the tension between them one bit; indeed, it would make things worse. Leaders Should Use Their Powers For Good – In a move that surprises no one, the philanthropic Papa Smurf has been known to lend his likeness to plenty of public service announcements over the years, doing his best to help kids and adults alike understand that we should all use our individual power for good causes. Papa Smurf is a great role model for any child, or adult, for that matter. He is a great example of a strong but gentle leader, whose wisdom can be trusted.